The Guild Chapel has plenty of secrets yet to be uncovered! In 2016, conservators cut away small sections of panelling running down both sides of the Chapel to reveal something hugely exciting – fragments of both the Dance of Death and Lyf of Adam – a work previously never properly documented. What lies beneath the rest of the panelling is yet to be discovered with surveys underway to establish the next step forward. Ultimately we need to secure further funding to uncover and conserve more paintings going forward. We know other scenes are hidden within the Chapel’s walls. Then there are our ‘Angels in the Attic’ – beautifully preserved angels and the head of Christ, hidden away in Chapel loft. They form the top part of the ‘Doom’ – but were cut off when the current ceiling was installed in the 19th Century. We understand the chancel walls were decorated with ten scenes from the Legend of the True Cross, although sadly these were all lost when the Chapel was re-modelled in the 19th Century. 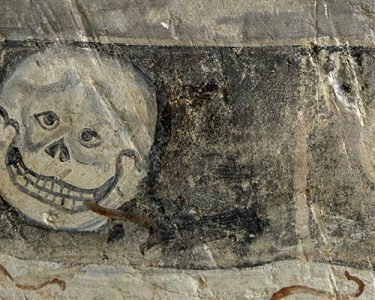 On the lower north wall of the nave was the Dance of Death or Danse Macabre – a series of images showing people from every station in life being led off by Death. While it is thought much of this detail has been lost, we believe fragments of this painting remain. On the south wall we have started to uncover what is believed to be previously undocumented scenes from the Lyf of Adam – a work previously thought lost altogether. From the small section we have revealed, it is clear a lot of detail in fact remains and we’re hoping to continue to uncover and discover more. Another painting that we hope to discover more about is the Whore of Babylon, currently hidden from view behind the organ case on the west wall. It was last exposed in the 19th century. The Guild Chapel’s walls would also have been filled with paintings of saints. Fragmentary remains of some can still be seen today and we hope further conservation work can be undertaken so that we can reveal and record more. We believe St Modwena, St Ursula and St Edmund are the only surviving saints in the niches of the north and south walls. All the niches in Chapel would originally have depicted saints. On the west wall, fragmentary remains of two paintings can be seen – the Martyrdom of Saint Thomas Becket and Saint George slaying the Dragon. If you would like to make a donation to support the Chapel and the conservation please click here for more information.